Thank you & congratulations to our SUPER SPONSOR of the month, Tilly’s with 14 Adopt-a-Hwy locations! 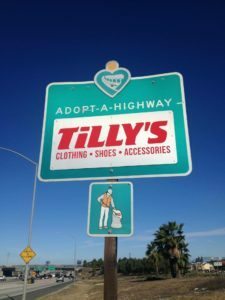 Headquartered in Irvine, Ca Tilly’s is a top clothing & accessory retailer for men, women, & children. Look for their signs through out Orange County (7), San Diego (4), Sacramento (1) and San Bernardino (2). This entry was posted	on Thursday, October 27th, 2016 at 4:28 pm	and is filed under Sponsor Highlights. You can follow any responses to this entry through the RSS 2.0 feed. You can leave a response, or trackback from your own site.